ZuluTrade - convenient service for those, who want to make some additional income, broadcasting their deals and getting the commission from investors. Personally, I was a practicing trader find this option the most interesting - I'm practicing my personal approach for a long time already and this is not interesting for me just to copy somebody's deals. But if you have pretty stable monthly results and you can provide the reports, you will not be lacking subscribers - this is quite good additional income, which does not require any efforts from you. Zulu is the only company, which offers a similar service. Many brokers have PAMM, MAMM programs, deals copying services and so on. But Zulu has a reputation, big base of active clients, and the company is being trusted. Additionally, ZuluTrade cooperates with the dozens of brokers - and it is better than the one linked to the broker. Of course, the company has its disadvantages - for example, commissions are not the lowest on the market. But for me reliability is way more important, especially taking into consideration that commissions are significantly compensated by the number of subscribers and income from them. It's a scam , don't waste your time guys , they not updating my trades & my rank also..if u show your performance in quick duration they wnt update profit pips & rank too..so dont waste your time..
Best broker. They are transparent and their Support is very helpful. I would re ommend it to my closest friends. Complete Scam to get deposits for affiliate sites, dont waste your time. Have moved money from a legitimate company to try Zulutrade and after many hours of attemptingting to link with other accounts and speaking to 3 different employees none of them were able to do as promised. Thank you for expressing your opinion about ZuluTrade. However contrary to your remarks, ZuluTrade is licensed in Europe and it fully complies with the European regulation which does not leave any room for misinterpretations. As for your comment-feedback regarding our Affiliation Program, we would like to point out that the Program lists more than 35K partners, closely monitored by our dedicated Affiliates Desk. We have set up strict rules and guidelines with the aim to ensure that the values of ZuluTrade will be respected by those who will decide to partner with us. These rules have been clearly communicated with all ZuluTrade Affiliates. Most of our Affiliates offer very well designed websites containing useful information, educational videos and tutorials that will help their audience discover ZuluTrade, register their account and set up their portfolio. They offer trading educational material aiming to maintain a very high level of customer satisfaction. No commission is earned on an FTD basis, no benefit for the Affiliate. Moreover, as we mentioned above, our dedicated Affiliates Desk team constantly monitor and evaluate the Affiliates, supports their effort and ban those who fail to comply with the established rules. Although the Affiliates are independent Marketers, they always must respect, comply and follow the guidelines of our Program. However, as you may understand, it is not feasible to have control over the net so, it could be that something has slipped our attention. In this case, we invite you or anyone else to report to us any abnormal marketing activity from any ZuluTrade promoter and we commit that the necessary actions will be taken immediately. Finally, you mention that you failed to connect your account to ZuluTrade while you communicated your problem with our Operators. We cannot see how we can help you since we do not have any contact details from you or something that would facilitate us in confirming the validity of your comments, as hundreds of accounts from more than 50 Brokers worldwide get connected to ZuluTrade on a daily basis without problem. We welcome you to contact us at "qualitycontrol@zulutrade.com", should you require further clarification on our reply. You can only make Gas money for the month, in this if you have $10k to invest, a small account with $1k or $500 is not going to take you anywhere, I started a demo account with $400 and bam, their overly incompetent traders who are ranked at top by their stupid algo, cannot even close a position without keeping it up for weeks, and make only about 20-25 pips in profit. When you select 5-7 traders in your portfolio, rest 4-6 are going to make you 5-15 pips in profit and then one trader in your portfolio is going to come with a massive 70-100 pips loosing trade, basically you aren't going to make any money if not loosing, your profits are going to wash and you will endup in break-even everyday. Waste of time and energy to be honest. I don't know how these companies make to world class rank, without their effeicent business model. Thank you for expressing your opinion about your experience and the impression that it left you with. contact us to share their opinions with us whenever an issue or concern arises. have the option to contact our Customer Support service from Monday to Friday, 24/05 they are there to render their assistance. It is in ZuluTrade’s best financial interest for our users to be successful and to maintain enduring, lucrative relationships with them. With this in mind, we offer various features which can assist our Investors in formulating profitable strategies. Our ZuluGuard and Automator functions allows our users to shield profits and prevent additional loss from what you have selected. There is also our Traders‘ Combos option. With this option, you do not need to exert time looking for the right Trader to follow. We have created combinations of Traders to match every need, based on the investment capital and the risk that the client wishes to take. as with Classics accounts. Easy and simple. Traders and for formulating a profitable strategy which users should copy successfully in their Real Follower account. (support@zulutrade.com) to answer your questions and guide you through any processes that you are interested in. I have requested my commission/fees from zulutrade since i am a trader in their site. It was for USD180 since 1/May. Today 15Jun just 15 days before my payment was due to be released (their site stated clearly thats its 60days to process a payment), I received an email to inform me that zulu finance team has an "issue" to pay me via paypal, and that finance team has not yet "confirmed" when it can do so. The staff wanted to pay me via bank wire which has a charge but they have kindly maybe consider a reduction in comms. If I insists on paypal the delay cant be "confirmed". If I wanted payment via wire there might be a reduction to bank charges. unfortunately, there is a temporary difficulty with payments via Paypal. The bank transfer will be executed immediately within few days. Also, we are going to minimize the commissions. The finance department hasn't confirmed yet, how long this difficulty will take, so we thought that a bank transfer will be better for you. If you have submitted your bank details on your profile, then it is ok.
Is it ok to execute your payment to your bank account? Thank you very much for expressing your concern regarding your payment request. We would like to inform you that this is a temporary situation that is beyond our control regarding payments via PayPal. Therefore, as an alternative and in order to avoid payment delays, payment by Bank Wire is the best solution. Kindly note that for your specific case, all fees associated with the withdrawal request fees will be absorbed by our Company. A member of our company will contact you directly by email to provide you with details. However contrary to your remark, ZuluTrade would like to clarify that it certainly does pay its Traders, provided that they meet the defined requirements as stated in our online Traders' Guide (https://www.zulutrade.com/trader-guide). To be specific, it clearly states in the Traders' Guide that "An active account balance with a minimum of $100 is required before proceeding to request a payment." However, if a Trader opts to trade with Live Funds, he/she may then opt to use the "AutoPay Service for Live Traders", for which there are no minimum amount requirements nor do fees apply if the AutoPay option is enabled. Finally, please note that ZuluTrade's policies are well defined and completely transparent as stated on its website. Our policies are publically accessable for all to see and read prior to accepting and entering into a business collaboration with ZuluTrade. We welcome you to contact us at "qualitycontrol@zulutrade.com", should you require further assistance. I have read comments saying Zulutrade is scam, probably for providers, because zulu may not be paying the promised commissions to them. But for followers they are not scam but is a graveyard just because of the very nature of forex. There are no decent providers on zulu. just think about it , if any trader is good he/she would be trading solely to make money and why go through the troubles of zulu to get petty commissions. Zulu providers are just newbies who got tricked with the zulu graphs and lost their money and trying to recover it with "live" accounts of max 1000$ may be and demo accounts. Golden rule of Forex is that DO NOT FOLLOW any strategy that does not have at least 2 years of success history on live account and on Zulu there are not a single such provider, if any are out there with a 2+ yrs success history, it would be on demo not live. Apply your logic and test with a demo on zulu. Thank you for expressing your opinion. We would like to clarify that ZuluTrade is in no way "scam". ZuluTrade is for everyone and the best use of the tools that we provide may increase the safety of your account and the profits obtained. At ZuluTrade, our main concern is the best interest of the clients, which is why we provide an incentive to our Traders to be profitable (eg. they do not provide commissions for months with Negative Monthly PnL). However, please note that ZuluTrade respects its Traders and always pays its Traders their due commissions, provided they comply and perform in accordance with the defined guidelines as stipulated in the Traders Guide (zulutrade.com/trader-guide). Zulutrade has an agreement to markup the spreads by roughly 1.5pips with its brokers so yes while the broker is the one who marks it up Zulutrade does take the majority of the fees in this regard. Then on top of the fees brokers are charged a set fee monthly to be linked on zulutrade. Over and above this Zulutrade then charges you to make withdrawals for comms paid by zulutrade to either affiliates or traders, that is if they actually pay you the comms due to you. I have experienced signups that have some how not appeared under my IB, signups that have appeared and no commission from them even when I have their trading history and sent it in. Forget about all the signups that may have happened that I have not personally assisted with. The payment process that actually get paid take 3 months apparently though mine took around 5 months for my first payment which is ridiculous considerring you can only request funds that have been in your account for a month or so. And I havent even mentioned the fact that traders deamed "risky" profit or not are not paid so "by their discretion" I bet they are making a fortune. the Followers Program, the Traders Program, and the Affiliates Program. ZuluTrade has a business agreement with each of its collaborating Broker. This is a Contract for Service Rendering from ZuluTrade to the Brokers that have selected to offer its services to their users. ZuluTrade's compensation is not something that can be shared with its clients, specifically because it does not relate to their interests in any way. 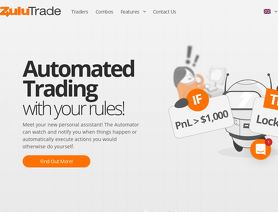 ZuluTrade also offers its technological product to the Brokers and is compensated for that. Moreover, ZuluTrade does not charge any fees directly to its users, whereas the Brokers charge a commission for offering accounts linked to ZuluTrade. This is something stated on ZuluTrade's website (https://www.zulutrade.com/select-broker) and the client is obliged to sign an LOD form prior to being enabled in ZuluTrade which means that they have read and agreed to this markup imposed by the Broker and not ZuluTrade - this is irrelevant to the business agreement signed between the Broker and ZuluTrade. The Traders Program is offered by ZuluTrade to any user who wishes to share his signals with the rest of the ZuluTrade Community and in return earn commissions for their business. Same thing for the Affiliates Program which is open to all those who wish to promote ZuluTrade and get compensated for the business they bring in. They are not relating to any Broker whatsoever, it is just a simple agreement, a Contract of service rendering FROM the Trader/Affiliate TO ZuluTrade. And ZuluTrade needs to compensate the provider of the service. It is as simple as that. We receive a service from someone, we pay that provider for his or her service. For Traders / Affiliates Program, we charge a withdrawal fee in order to cover all the transaction fees that are imposed to us by third-party financial institutions involved for the execution of the payment, that is why the fee is not the same for all withdrawals but depends on the payment method. As per your remarks concerning delayed payments, we acknowledge the delays which we have faced in the past, but we have made important strides in improving the payment process and we are back to normal in terms of being able to process payments within the defined payment time-frame. We welcome you to contact us at "qualitycontrol@zulutrade.com" if you ever require any further assistance.